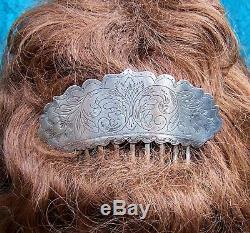 A handsome early Victorian Spanish style silver plated hair comb with engraved design. SIZE: 4 ins h x 4½ ins w (10 x 11 cm). 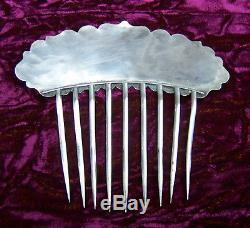 Here is a pretty early Victorian hair comb which is made from silver plating on steel. The classic restrained design is typical of the period. 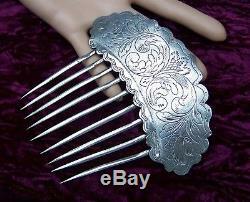 The comb has a gently scalloped profile to the heading and nine long metal tines, which are attached separately. These are all in good condition, not bent or twisted. 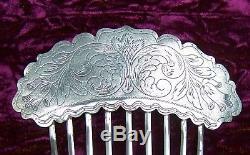 The heading is engraved with a beautiful formalised design of the type which is typical of such combs. It features classic scrollwork and foliage. 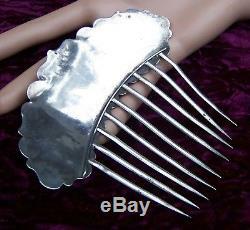 This type of ornament is often known as Spanish or mantilla comb because it resembles a smaller version of the traditional large shell ornaments worn by Spanish ladies with their native dress. 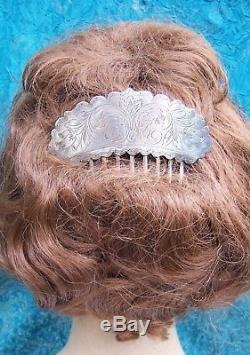 In practice any comb which has a high upstanding heading or top which stands proud of the top of the head is often called a mantilla comb. The collage picture shows sitters from contemporary sources, revealing the fashionable hair style and wearing similar ornaments. 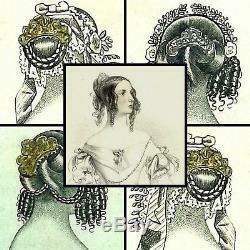 These are taken from an engraved fashion plate who dates from the late 1840s. 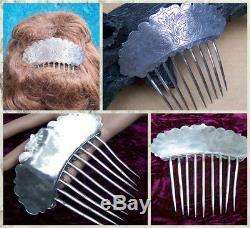 It shows a number of models with fashionable hairdressing and hair combs. The typical early Victorian hair dressing has bunches of curls at the sides and a plaited or twisted chignon low on the back. 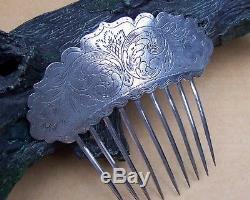 Into this is placed a metal comb with repousee work or set with stones. 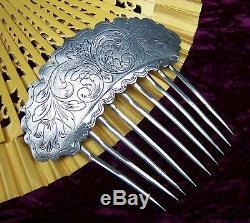 Such combs are very similar in character to our example here. 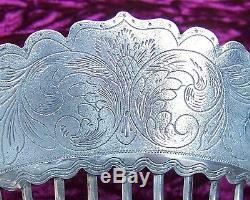 The item "Early Victorian hair comb silver plated engraved hair accessory" is in sale since Saturday, September 1, 2018. 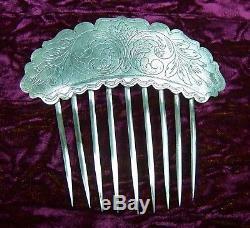 This item is in the category "Antiques\Periods & Styles\Victorian".